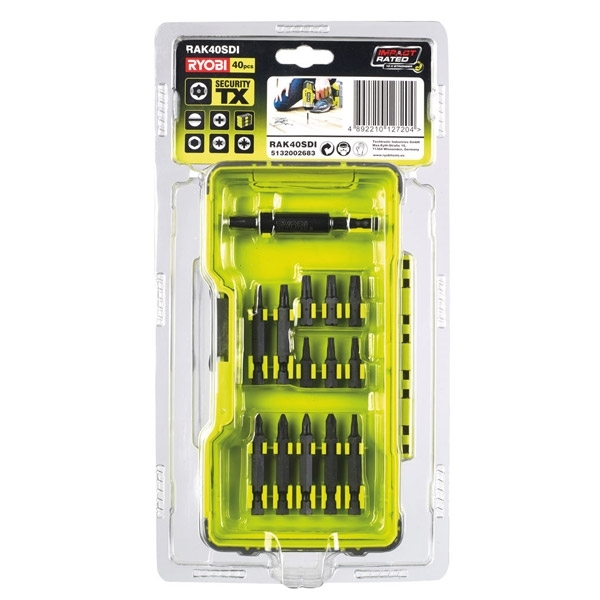 The Ryobi RAK40SDI is a 40 piece impact rated screwdriver bit set all in a sturdy compact carry case. 4 x 25mm IMPACT Phillips Bits: PH1, PH2(2), and PH3. 6 x 25mm IMPACT Pozidriv Bits (Two of Each): PZ1, PZ2, and PZ3. 4 x 25mm IMPACT Hex Bits: H3, H4, H5, and H6. 4 x 25mm IMPACT Slotted Bits: SL5, SL6(x2), and SL7. 14 x 25mm IMPACT Torx bits: TX6, TX7, TX8, TX9, TX10(x2), TX15(x2), TX20(x2), TX25(x2), TX30, and TX40. 2 x 50mm IMPACT Phillips Bits: PH1, and PH2. 2 x 50mm IMPACT Pozidriv Bits: PZ1 and PZ2. 3 x 50mm IMPACT Torx bits: TX10, TX15 and TX20.